THE NEW SOCIAL WORKER®, the social work careers magazine, has been published since 1994. Each issue provides practical articles on social work students, social work ethics, field placement, practice issues, practice specialties, technology in social work, book reviews, and more. The quarterly magazine for social work students, recent graduates, and others interested in the social work profession, was founded by Linda May Grobman, MSW, ACSW, LSW. 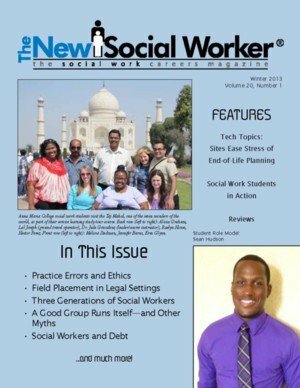 THE NEW SOCIAL WORKER® is pleased to be the winner of the 2013 NASW Media Award for Best Magazine/Best Magazine Article. The winning article was published in the Fall 2012 issue, entitled "What I Wish I Had Known: Self Care and Burnout in our Social Work Profession," by SaraKay Smullens.